We read in the Gospel how Holy Week began with Jesus entering the temple and driving out all those that bought and sold. He then rebuked the vendors of doves: "Get these things out of here!" He was so crystal clear in his command that it was if he said, "I have a right to this temple and I alone will be in it and have control of it." What does this have to say to us? The temple God wants to be master of is the human soul, which he created and fashioned just like himself. We read that God said, "Let us make man in our own image." And he did it. He made each soul so much like himself that nothing else in heaven or on earth resembles him as much. That is why God wants the temple to be pure, so pure that nothing should dwell there except he himself. And that is the reason why he is so pleased when we really prepare our souls for him. When we do this, when he alone dwells in our hearts, he takes great comfort. But who, exactly, are the people who buy and sell? Are they not precisely the good people? See! The merchants are those who only guard against mortal sins. They strive to be good people who do their good deeds to the glory of God, such as fasting, watching, praying and the like - all of which are good - and yet do these things so that God will give them something in exchange. Their efforts are contingent upon God doing something they ardently want to have done. They are all merchants. They want to exchange one thing for another and to trade with our Lord. But they will be cheated out of their bargain - for what they have or have attained is actually given to them by God. Lest we forget, we do what we do only by the help of God, and so God is never obligated to us. God gives us nothing and does nothing except out of his own free will. What we are we are because of God, and whatever we have we receive from God and not by our own contriving. Therefore God is not in the least obligated to us - neither for our deeds nor for our gifts. He gives to us freely. Besides, Christ himself says, "Without me, you can do nothing." People are very foolish when they want to trade with God. They know little or nothing of the truth. And God will strike them and drive them out of the temple. Light and darkness cannot exist side by side. God himself is the truth. When he enters the temple, he drives out ignorance and darkness and reveals himself in light and truth. Then, when the truth is known, merchants must depart - for truth wants no merchandising! God does not seek his own benefit. In everything he acts only out of love. Thus, the person who is united with God lives the same way - he is innocent and free. He lives for love without asking why, and solely for the glory of God, never seeking his own advantage. God alone is at work in him. Jesus went into the temple and drove out those that bought and sold. His message was bold: "Take this all away!" But observe that when all was cleared, there was nobody left but Jesus. And when he is alone he is able to speak in the temple of the soul. Observe this also, for it is certain. If anyone else is speaking in the temple of the soul, Jesus keeps still, as if he were not at home. And he is not at home wherever there are strange guests - guests with whom the soul holds conversation, guests who always seek to bargain. If Jesus is to speak and be heard the soul must be alone and quiet. And what does Jesus say when the soul has been cleared? His word is a revelation of himself and everything the Father has said to him. He reveals the Father's majesty with unmeasured power. If in your spirit you discover this power, you will possess a like power in whatever you do - a power that will enable you to live undividedly and pure. Neither joy nor sorrow, no, nor any created thing will be able to disrupt your soul. For Christ will remain and he will cast aside all that is insignificant and futile. "Now the gift, if there is any, would no doubt be related to economy. One cannot treat the gift, this goes without saying, without treating this relation to economy, even to the money economy. But is not the gift, if there is any, also that which interrupts economy? That which, in suspending economic calculation, no longer gives rise to exchange? That which opens the circle so as to defy reciprocity or symmetry, the common measure, and so as to turn aside the return in view of the no-return? If there is gift, the given of the gift (that which one gives, that which is given, the gift as given thing or as act of donation) must not come back to the giving (let us not already say to the subject, to the donor). It must not circulate, it must not be exchanged, it must not in any case be exhausted, as a gift, by the process of exchange, by the movement of circulation, of the circle in the form of return to the point of departure. If the figure of the circle is essential to economics the gift must remain aneconomic. Not that it remains foreign to the circle, but it must keep a relation of foreignness to the circle, a relation without relation of familiar foreignness. It is perhaps in this sense that the gift is the impossible. "Not impossible but the impossible. The very figure of the impossible. It announces itself, gives itself to be thought as the impossible. It is proposed that we begin by this." --Jacques Derrida, Given Time: I. Counterfeit Money, tr. Peggy Kamuf (Chicago, University of Chicago Press, 1994), 7. Lest we forget, we do what we do only by the help of God, and so God is never obligated to us. God gives us nothing and does nothing except out of his own free will. What we are we are because of God, and whatever we have we receive from God and not by our own contriving. Therefore God is not in the least obligated to us - neither for our deeds nor for our gifts. He gives to us freely. The gift of life itself interrupts the cycle of exchange, even as it creates one. It creates an obligation to God (even though, post-Enlightenment creatures that we are, we despise the idea of obligation! ), but at the same time we are no more obligated to God than God is obligated to us. Were it not so, there would be no gift; there would be only an economy, an exchange. And what do we exchange with God, what contract do we reciprocate, for the extravagance of a gift like this? Indeed, we cannot even know that it is a gift, because then it comes a part of the cycle rather than an interrution of it. But life itself interrupts the economy of the universe. It disrupts the cycle of explosion and collapse and explosion again that cosmologists tell us is the "Big Bang" theory. It is the opposition to chaos which the Greeks identified, an opposition doomed to failure, as chaos, in the end, prevails. Indifference to life, science assures us, is the nature of all that exists. Life is the disruption, even as it partakes in its own cycle of creation and death and rebirth. But the unmoved mover which is the first cause of all causes in this cause and effect centered cosmos...if that is not the source of all the gifts of what is, then it is the only way we can understand it. Life is a gift. Being, is a gift. And we cannot know the giver, and we cannot repay the favor, and we cannot enter into an exchange, because the gift we are discussing maintains always a foreignness to the circle. The circle remains indifferent, but the gift itself is against indifference. What wondrous love is this? The gift itself stands apart from doxologies and praises and prayers and worship. None of those things are an exchange for it, so that we cannot pray for our loved ones to be spared and have it happen. Does this present an indifferent creator, a truly unmoved and unmoveable mover? No. It confirms the conditions of existence, the nature of the gift. To return the gift once given, to reverse the nature of the gift and make it a part of the circle, a unit of exchange for which a bargain can be struck, something which can be merchandised, is to cancel the gift and re-create it as a commodity. The gift cannot even be acknowledged. When the Hebrews brought the first fruits to the priest and pronounced the blessing, they were not acknowledging the gift of their lives, but the circle of their existence, one tied intimately to their history: "A wandering Aramean was my father...." When God spoke to Abram for the first time, God did not promise Abram existence in exchange for worship; God proposed to show Abram the means for continuing and enriching life, for living well. There is an economy, an oikonomos, which even God recognizes and blesses. But before that, behind that, initial to that, is the gift: that gift is first given, the giver hidden and never to be seen; and that gift can never be exchanged. But it can be wasted, abused, misused. When Jesus tells the parable of the merchant who buys the pearl of great price; of the widow who burns the oil all night to find a lost coin that will appear in the daylight; of the buried treasure which only deceit and treachery can bring to the hands of the buyer of the land; and says all of these are like the basiliea tou theou, Jesus is speaking precisely of the merchandising of God. The kingdom of God is like gain that cannot be gained; it is like joy that must be shared. The kingdom of God begins in that moment when you have obtained your heart's desire and know wonder what you will do with it. If you uncover the treasure, your treachery is known. If you don't uncover the treasure, of what worth is it to you? If you sell the pearl, you won't have it anymore. 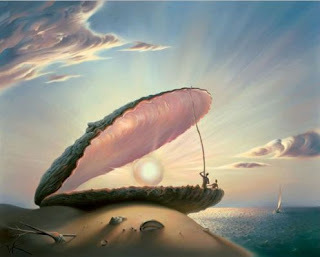 If you don't sell the pearl, how will you feed yourself tomorrow? Can we merchandise God? Or do we need, by hook or by crook, to get ourselves to the point where we have listened to all the voices of the world have to say, and now we must listen to the quiet, almost inaudible, voice of Jesus? If we start with the premise of the gift, if we recognize this gift invokes no system of exchange, is foreign to the circle of reciept and give again, in order to receive; if we recognize that "[our] efforts are contingent upon God doing something [we] ardently want to have done," and that such a contingency is foolishness, but at the terminus of our desires the kingdom of God begins to be visible...what then? Call it a Lenten meditation.